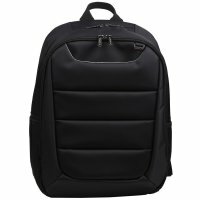 This lightweight backpack designed to carry and protect your laptop, tablet and some essentials with ease and comfort. It has highly organized interior and is suitable for 15.6″ laptop. This perfect hands free solution has special pocket for the player and holder for headphone. Backpack is supplemented with additional waist-belt which allows better fixation of backpack and partially bear the weight of the goods from the shoulders to the waist.